I love egg rolls, don't you? I pretty much love any type of egg roll, and lately I have been experimenting with dessert egg rolls! They are so much fun!! Plus, everyone loves them, from little ones to Grandma. I don't remember anyone ever refusing a dessert egg roll! 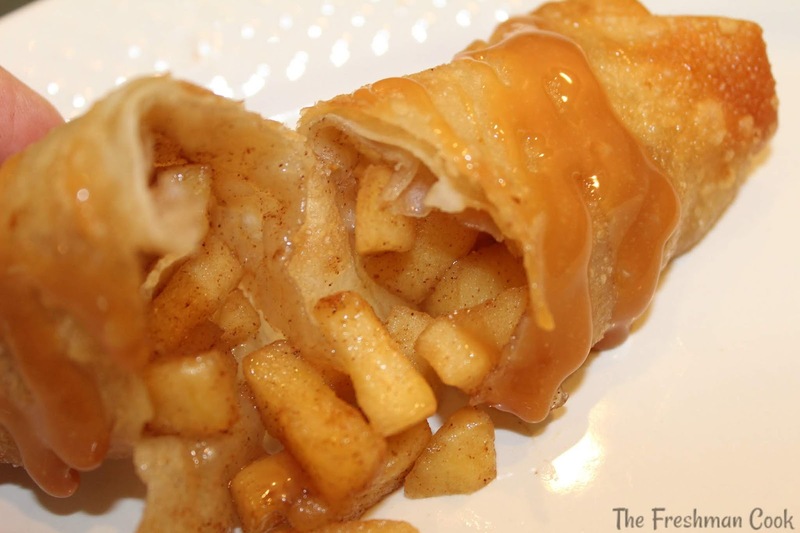 So, for #appleweek, I made these Caramel Drizzled Apple Pie Egg Rolls! They are crispy, full of Imperial sugar and spice, and apples that taste nice! 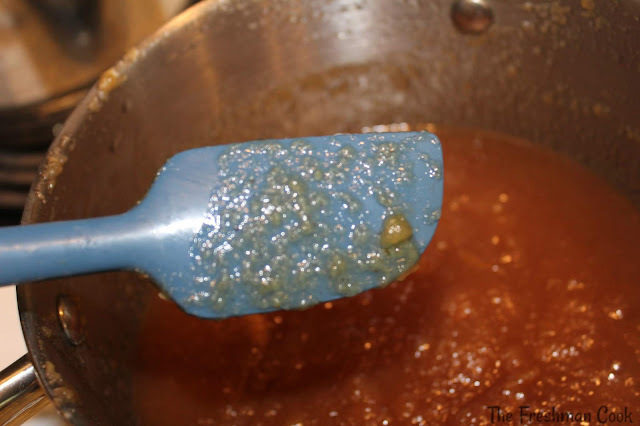 Drizzle with a creamy, caramel sauce for complete dessert euphoria! Peel and core the apples. Then chop them into smaller than bite sized pieces. 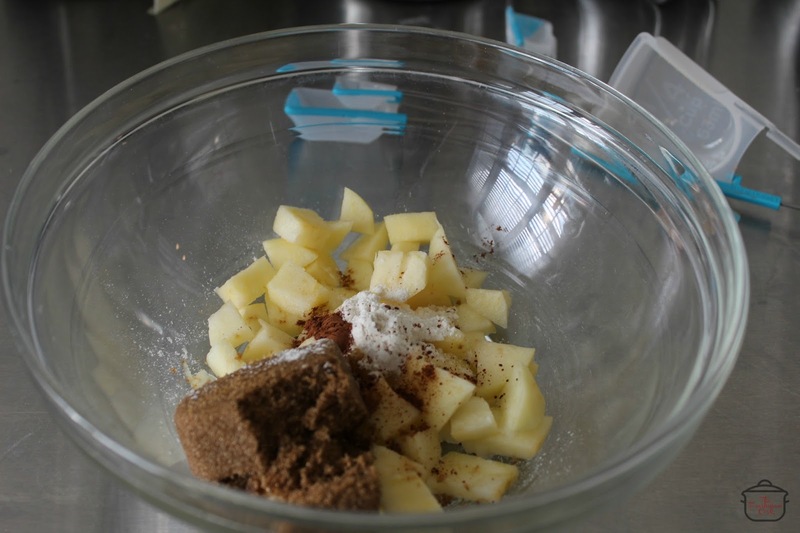 Mix together the Imperial Sugar, cinnamon and nutmeg in a bowl. 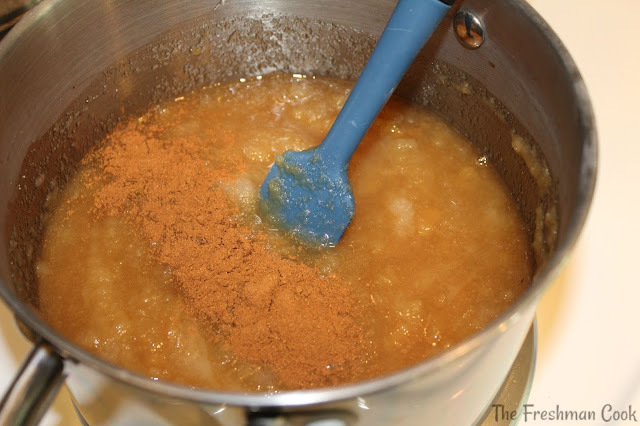 Pour sugar mix on to the apples, and thoroughly mix together. 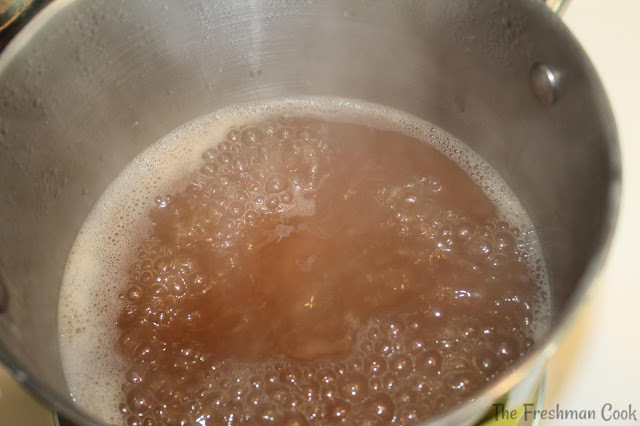 Melt a 1/2 tablespoon of butter in a large pan. Add the apple mix. 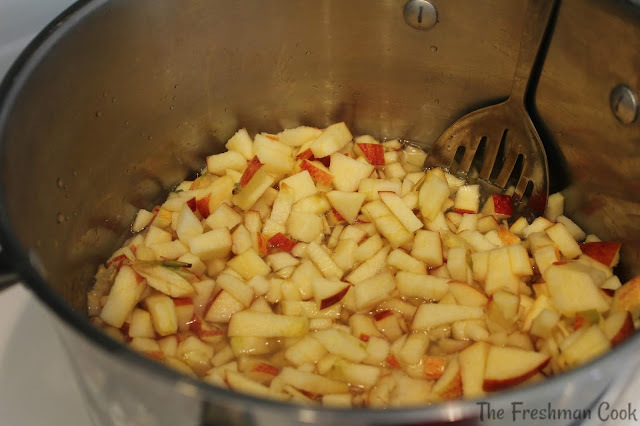 Cook on medium heat to start, stirring the apples often. 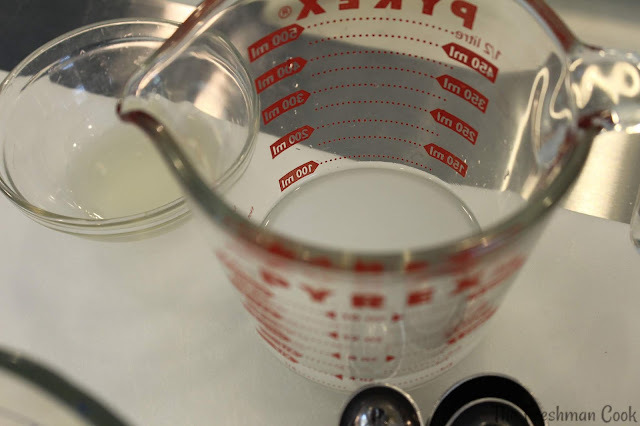 In a small measuring cup, mix together the corn starch and water. 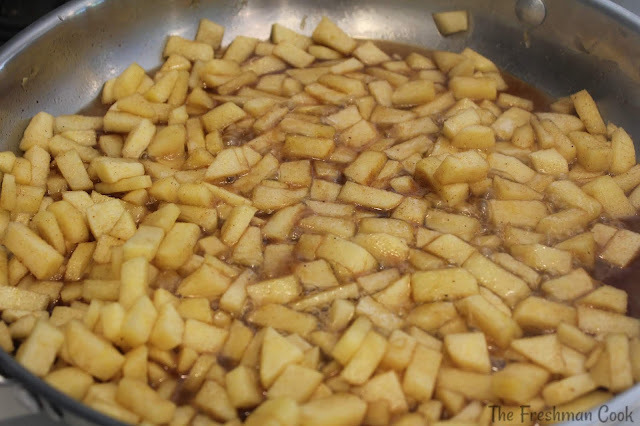 As your apples cook, you will want to thicken the sauce a bit. 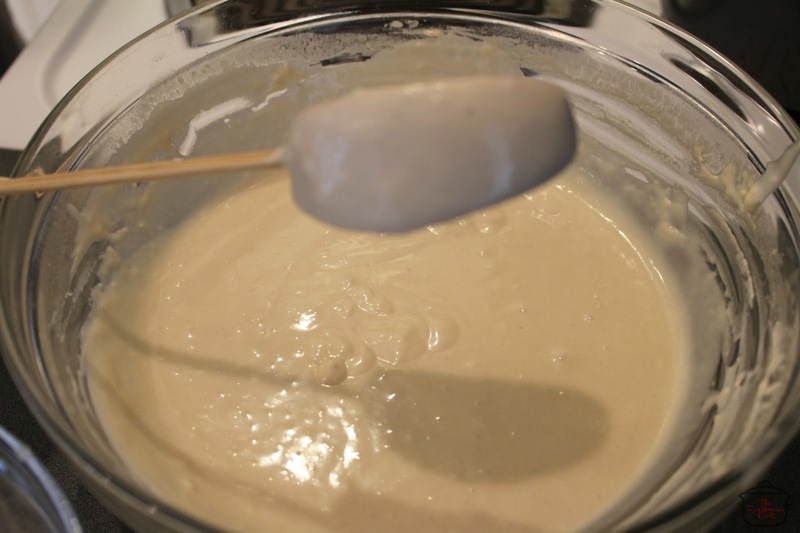 You need to make a roux. Add a little of the cornstarch mix to the apple mix. You may need to add more. The juices need to be mixed together with a whisk. 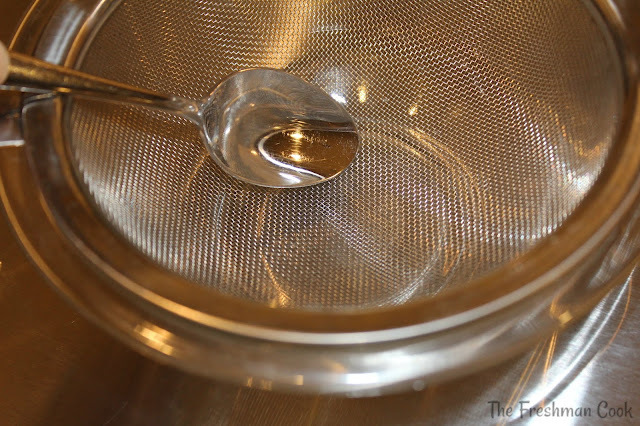 Turn the heat up to medium high and as the heat goes up, start whisking constantly. 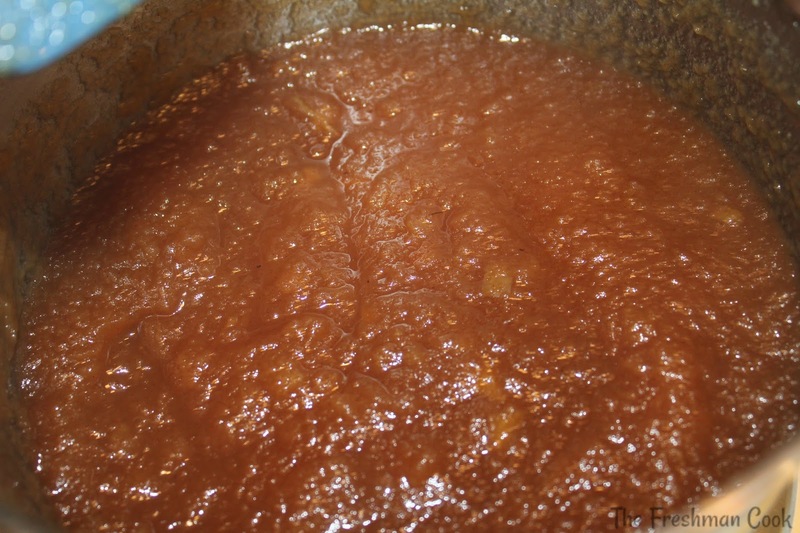 The immersion of the mix and the hot juice, will make the sauce thicken and be so tasty. 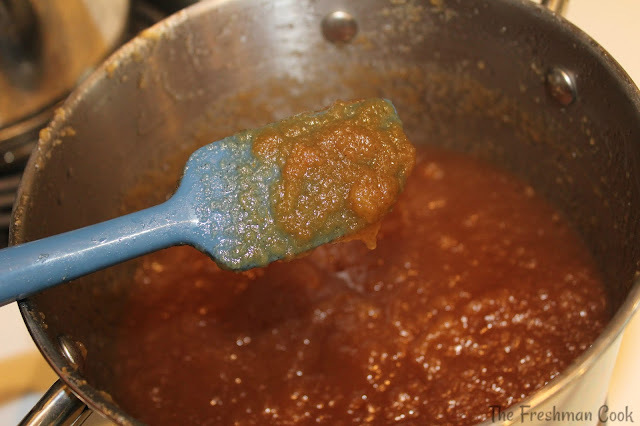 Once it is as thick as you want, pull the mix off the heat. 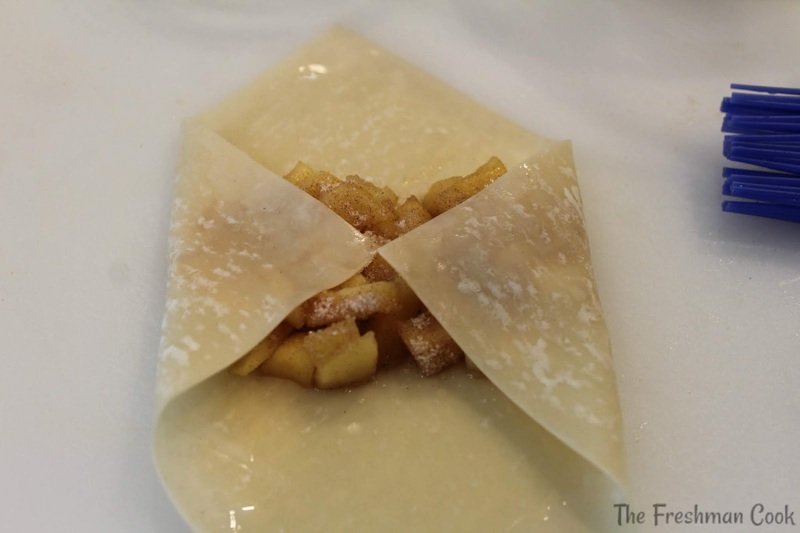 Lay the apple mix diagonal across an egg roll wrap. Using a bit of water and a pastry brush, brush water around the edge of one sde of the eggroll wrapper. 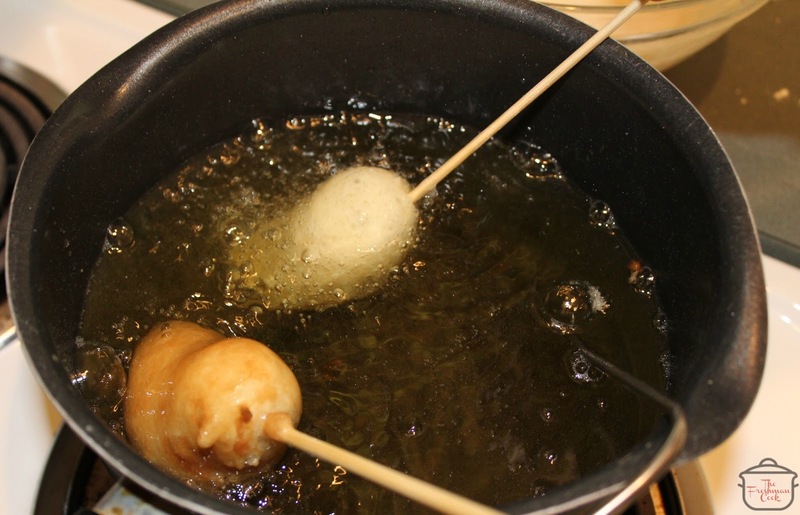 You are creating a border around the edges so they will not break open when you are frying them. Fold the right and left corners into each other.Then bring the bottom one up to meet the middle. Put a slight bit of pressure on the roll as you roll it to the top to secure it. 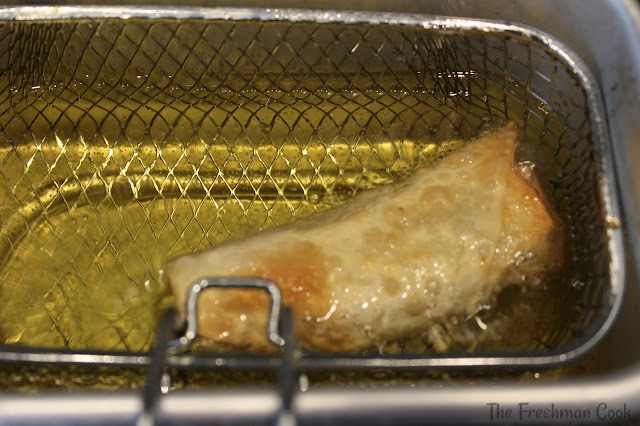 Place in a preheated fryer or pan and cook for 3-4 minutes at 350 degrees. They should be golden brown when they are done. 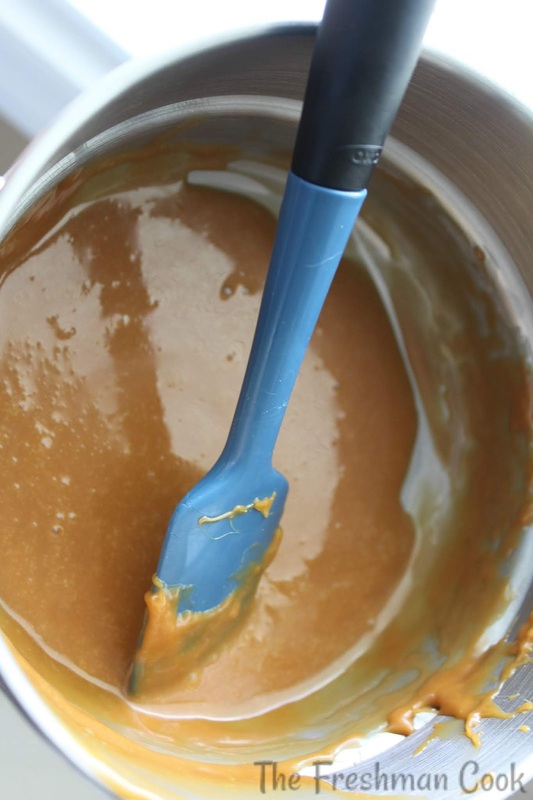 Melt the caramels in a double boiler. Once melted, heat the heavy duty whipping cream in the microwave for less than 10 seconds. 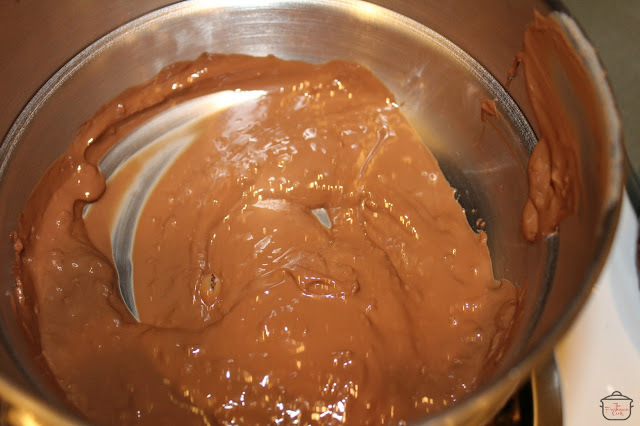 Once it is warm, add the cream to the melted cramel, a little at a time. It should be smooth and drip from the spoon when the spoon is lifted from the pan. 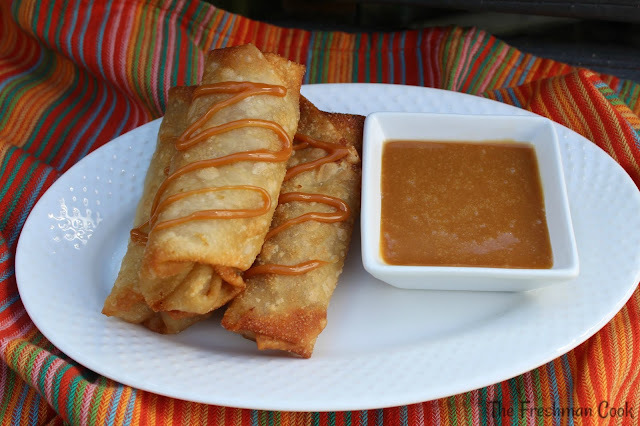 Drizzle the egg rolls with the caramel sauce. Serve additional sauce on the side. 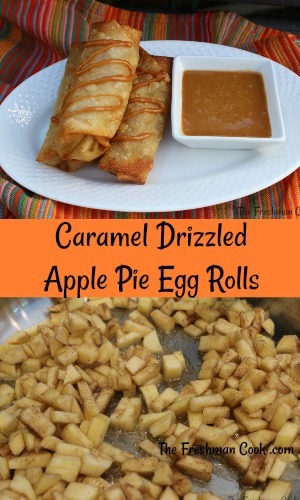 Look at these yummy Caramel Drizzled Apple Pie Egg Rolls! Thank you for stopping by today! I hope you give these dessert egg rolls a try. You won't be disappointed! Don't forget about our huge giveaway that is still going on! Drop by and enter today! Good Luck! 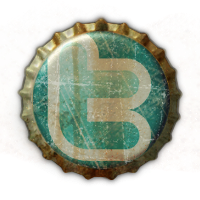 A lot of blogger friends made recipes for today! 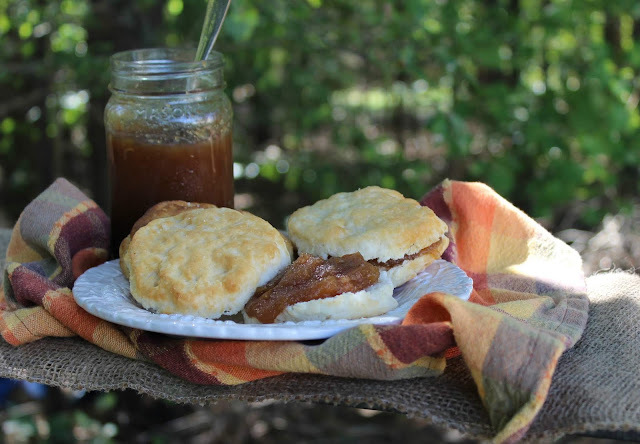 Check out this list of deliciousness and find something to make this weekend! With State Fair season coming up soon, I thought it would be fun to come up with a yummy treat, like you might see at the fair. These Battered Chocolate Caramel Apple Slices are easy to make, and they are tasty too! I used a boxed pancake mix, but I'm sure a homemade recipe will work also. 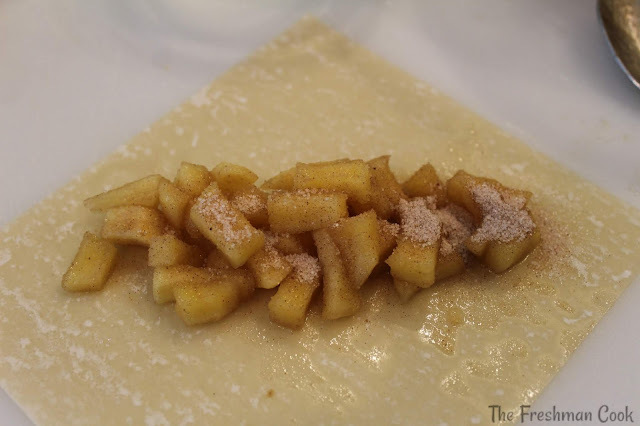 What I love about these is that the pancake coating is light and fluffy, but the apple stays crisp and delicious! These are such fun! 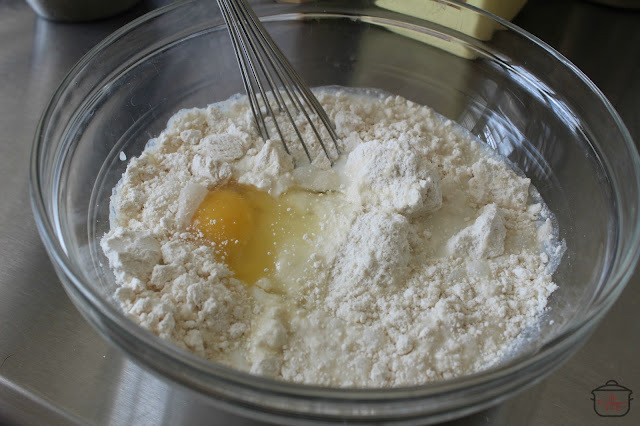 Mix pancake batter according to package directions. Add vanilla to batter. 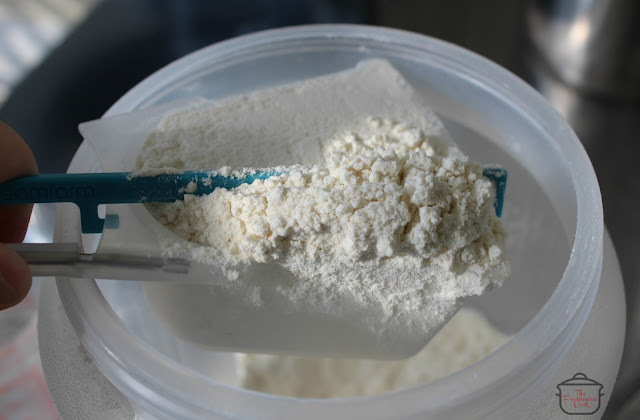 Also add a tablespoon of water at a time to the mix until it is smooth and a little thinner. 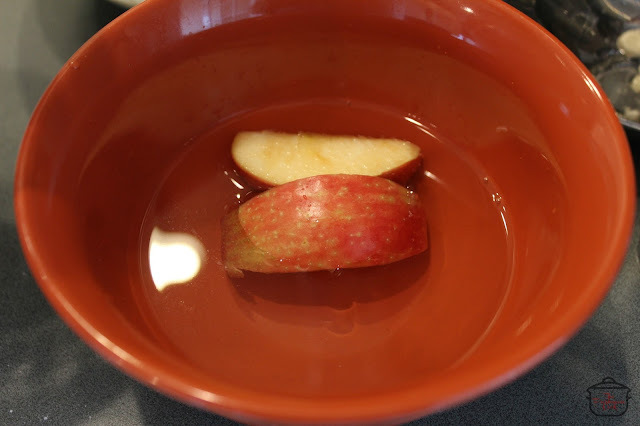 Place apple slices in a bowl of water. Measure the flour and place in a bowl. 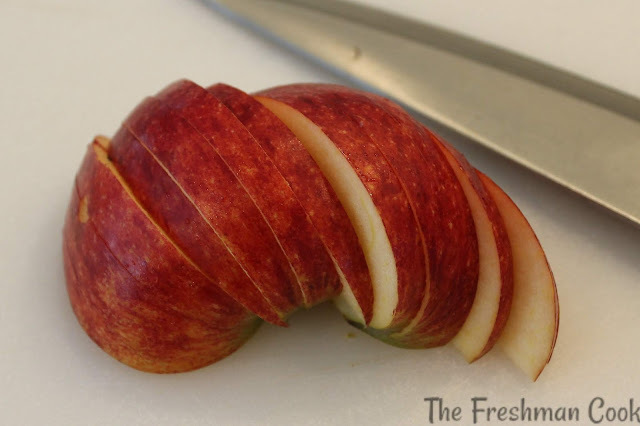 Add a stick to each apple. 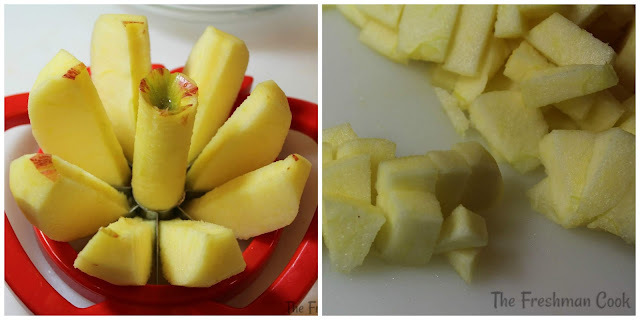 Dip apple in flour and lightly coat it. Dip apple into batter. Let it drip off the loose batter. It should stop dripping after a few drips. Place apples in oil and fry. Your oil should be at 350 degrees. Turn the apples while they are in the oil. It should only take a few minutes to fry. 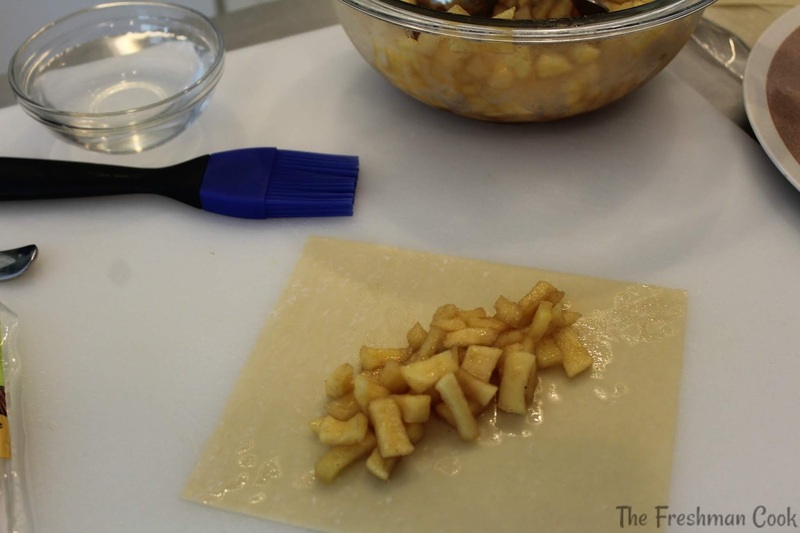 After taking the apples from the fryer, place them on paper towels to dry. Melt chocolate and caramels in double boilers. 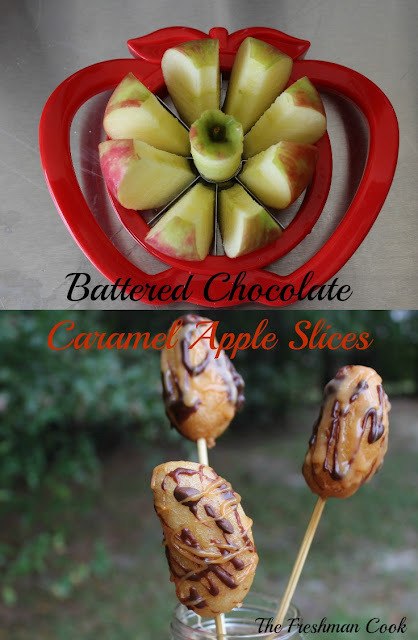 Drizzle the apples with chocolate and caramel however you want. 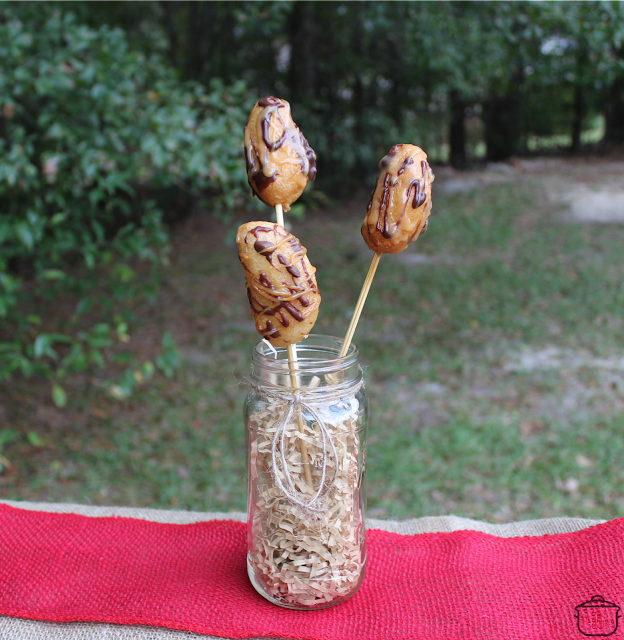 I drizzled with chocolate first, refrigerated them and then drizzled them with caramel and refrigerated them again. I think sprinkles would be cute on top of the chocolate and caramel, and so would powdered sugar! Follow this link! There are only 2 days left! 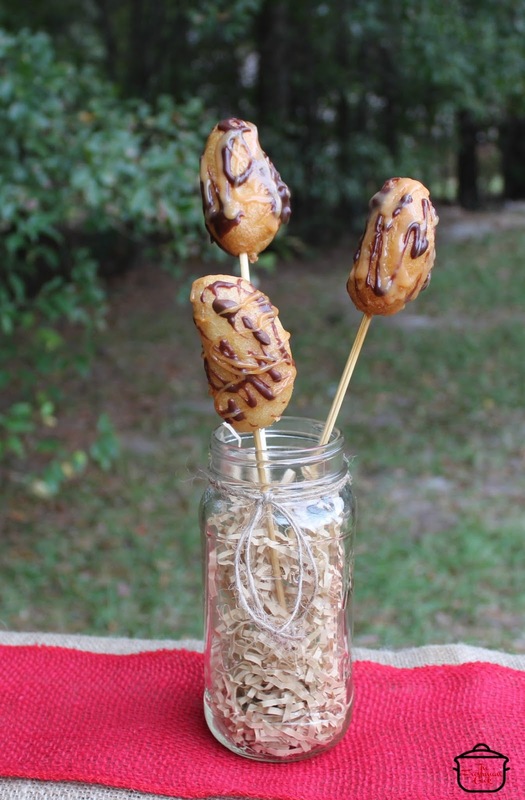 Drizzle the apples with chocolate and caramel however you want. I drizzled with chocolate first, refrigerated them and then drizzled them with caramel and refrigerated them again. I think sprinkles would be cute on top of the chocolate and caramel, and so would powdered sugar! Enjoy! Today starts a fun-filled week here at The Freshman Cook! It is Apple Week! 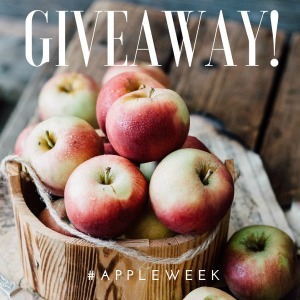 Apple Week is full of applelicious recipes from myself and my blogger friends, and there is a fun giveaway that starts today! 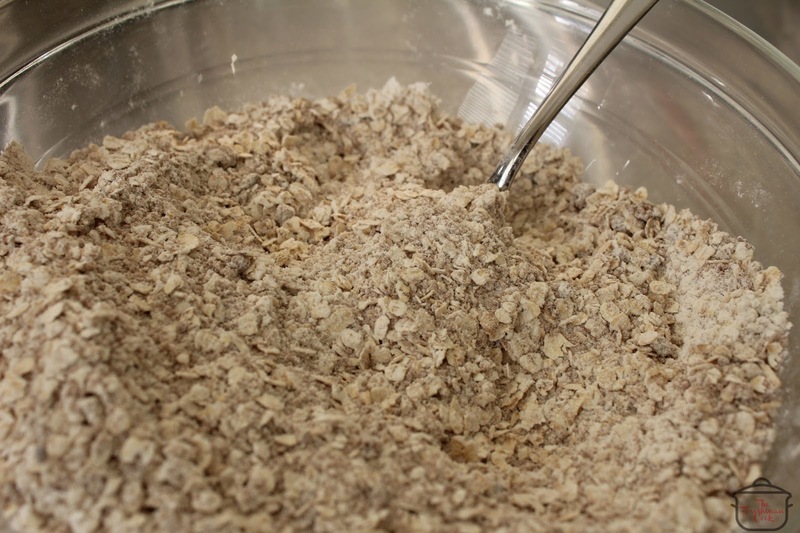 Thank you to Rainier Fruit and Flahaven's Irish Oatmeal for the products used in today's recipe post! 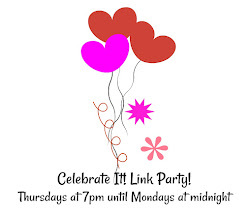 There are some amazing prizes, and I know you will want to enter! 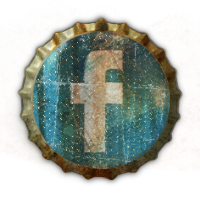 At the end of this post you will find info on how to enter to win some great prizes! Thank you to Carlee from Cooking with Carlee for all the long hours and hard work it took to put #appleweek together. 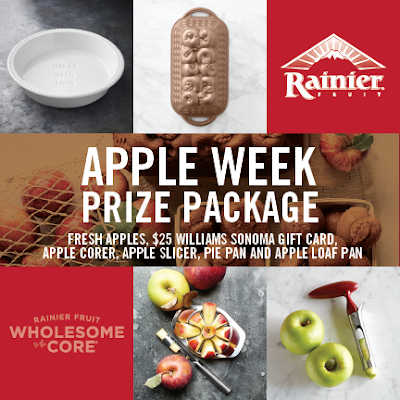 Thank you to #AppleWeek Sponsors: Rodelle, Dreamfarm, Casabella, Flahavan's Irish Oatmeal, Pryex, Chicago Cutlery, Rainier Fruit, and Veggie Wash for providing prizes for #AppleWeek free of charge. 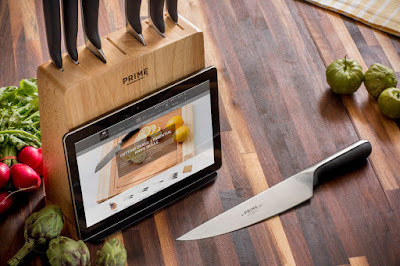 These companies also provided the bloggers with samples and product to use for #AppleWeek. All opinions are my own. 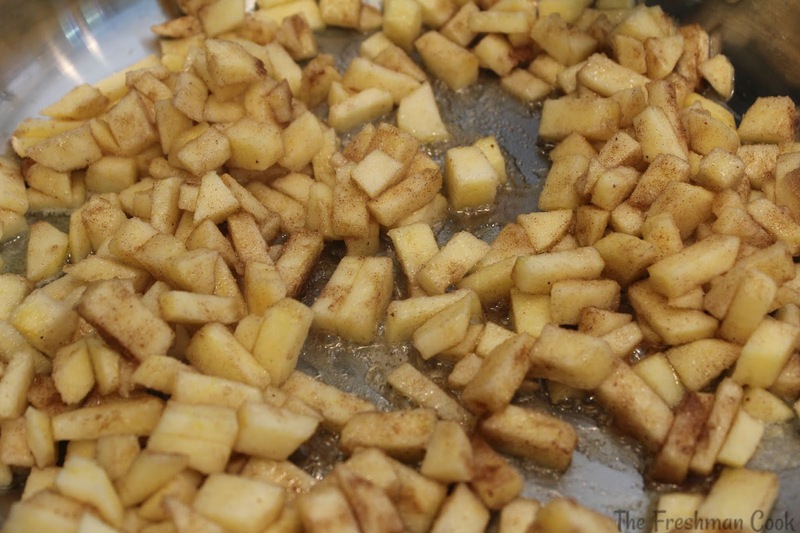 The very first recipe I cooked for my husbands extended family, after we were married, was a traditional apple crisp. 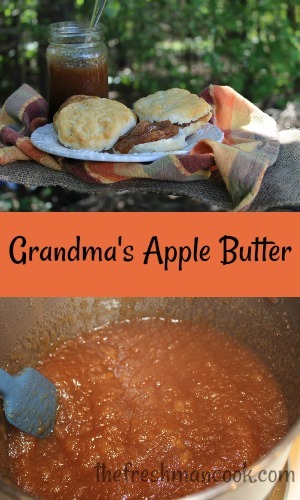 It was always one of my favorite fall recipes. Everything went well, it tasted great, and they ate every bite. I figured it was good luck! So, I try to bake one every year! But this year, I decided to branch out a little and put a special twist on my old favorite. 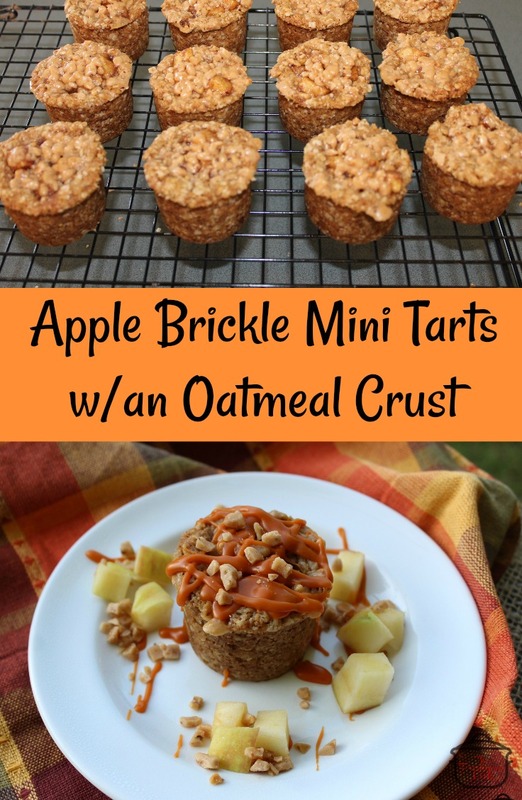 These Apple Brickle Mini Tarts w/ an Oatmeal Crust taste just like my old fave, but they definitely have a fun, new look. I know you are going to like them! 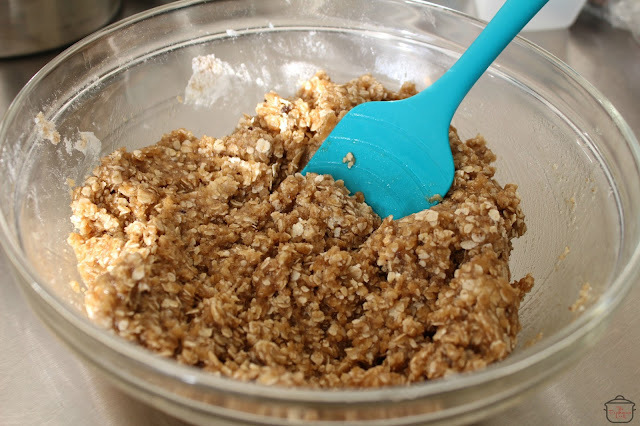 Make the crust by mixing the dark brown sugar, flour, oatmeal, roasted cinnamon, and nutmeg. 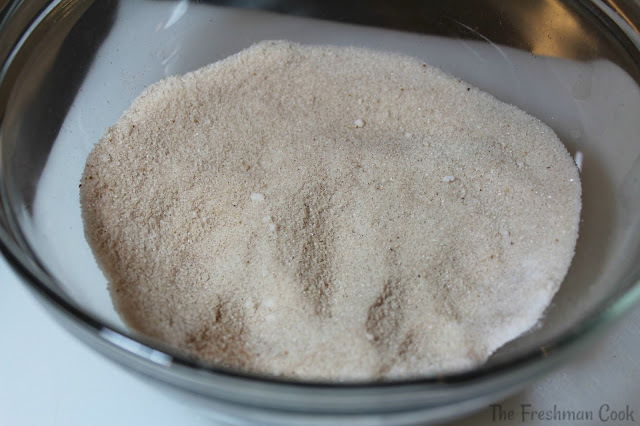 Regular cinnamon can be used also. 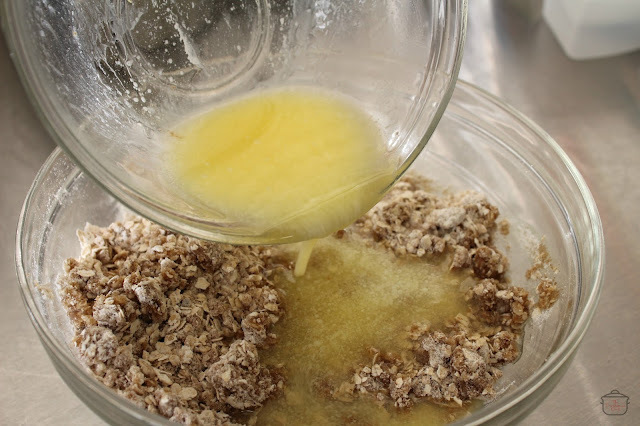 Add butter and mix together. It will all come together like this. 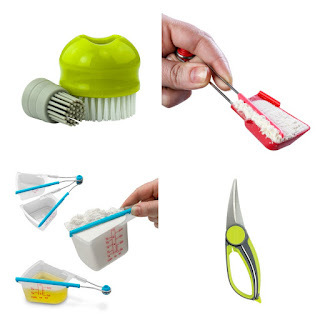 Sometimes when I don't feel like the spoon is doing the job, I put on disposable gloves for cooking, and mix the ingredients together with my hands. It's so much easier! Start measuring out the amount needed for your pan. 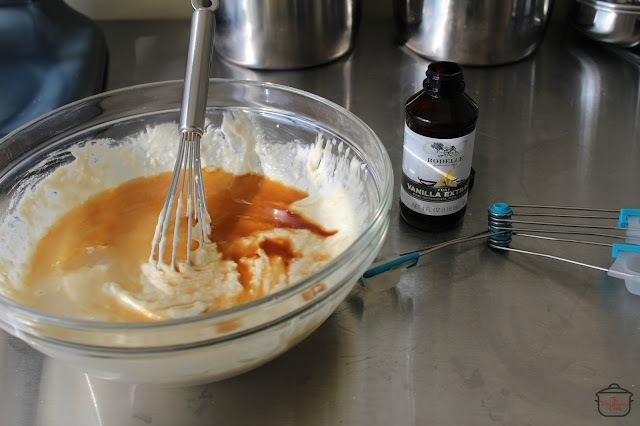 Mine needed 1 tablespoon and 2 teaspoons for each cup. 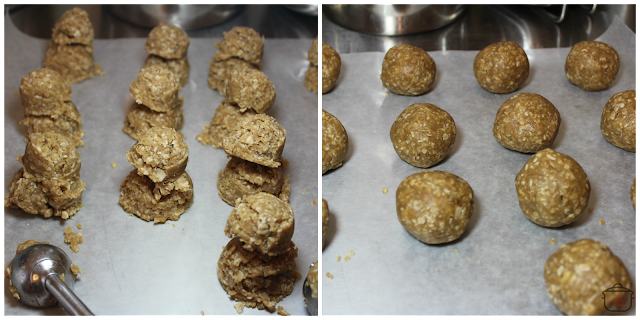 Then roll each separate amount into a ball as shown. Place a ball into each spot in the pan for the crust. I realize not everyone has this type of pan. 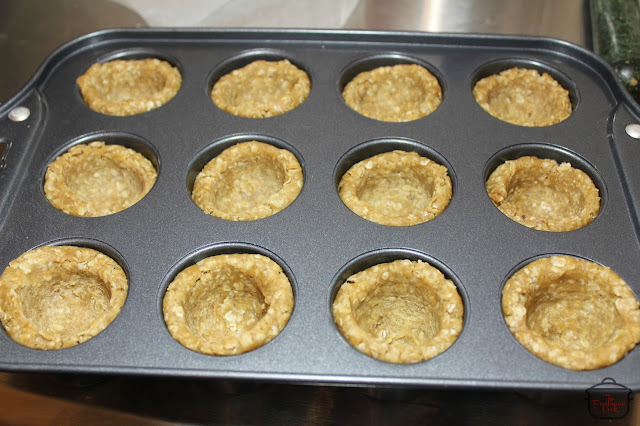 You could also make this in a regular cupcake tin or even a mini cupcake tin. You just have to figure out how much dough you will need for each crust. The best way to do that is to practice making a couple until you are happy with the size. 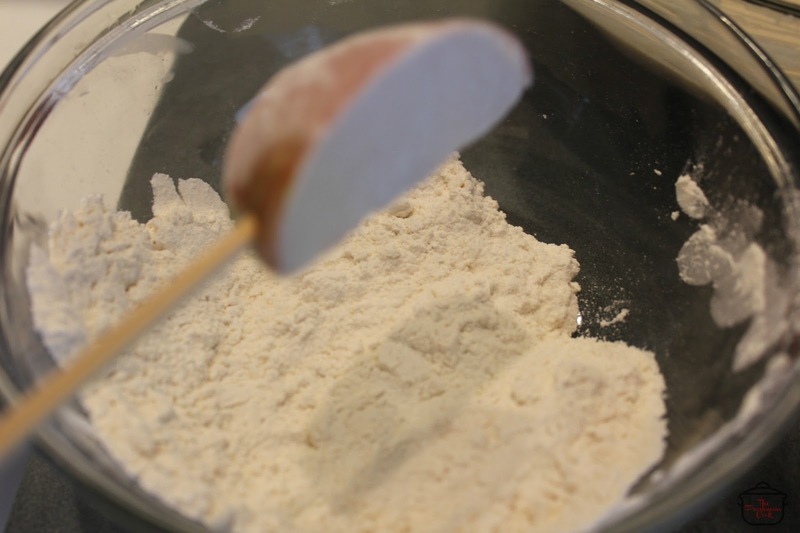 Use a pestle or something similar to create a whole in the center of the dough. Try to insert the pestle in the middle, so all the sides are of equal size. Peel the apples and cut into small, little chunks. You want then to be able to fit in to the cups. 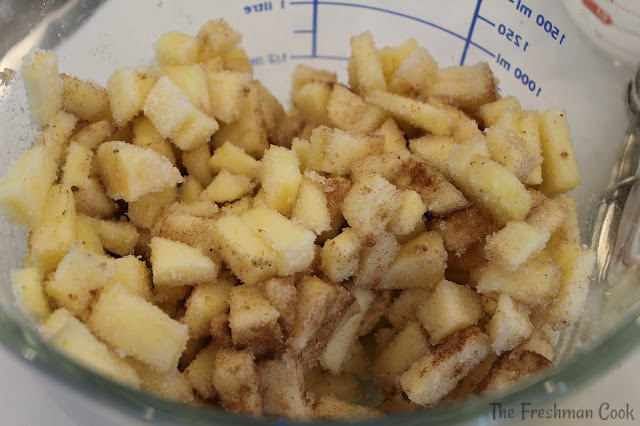 Add the sugar, flour, cinnamon and nutmeg to the bowl with the apples. Mix together. 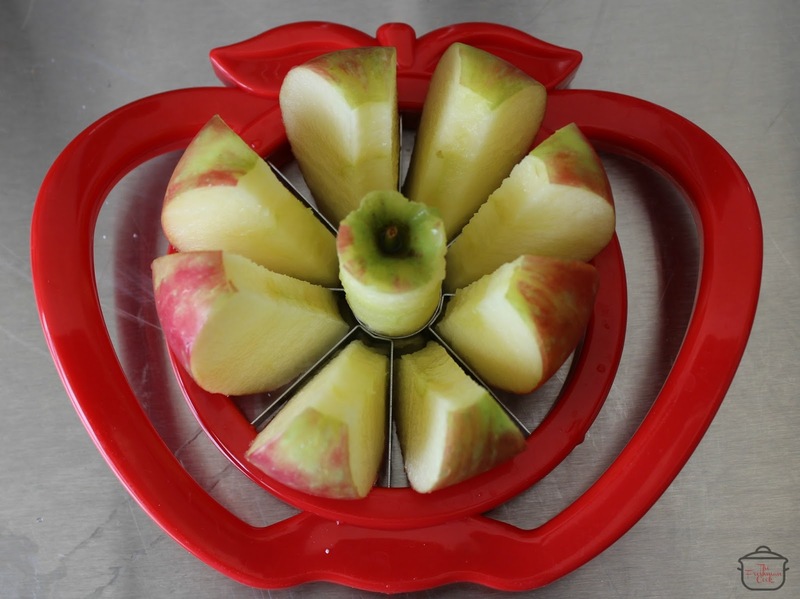 Fill each cup with the apple mix. Press them down in to the cup as you are filling them. I think it looks nice with a couple apples sticking out so they can be seen! 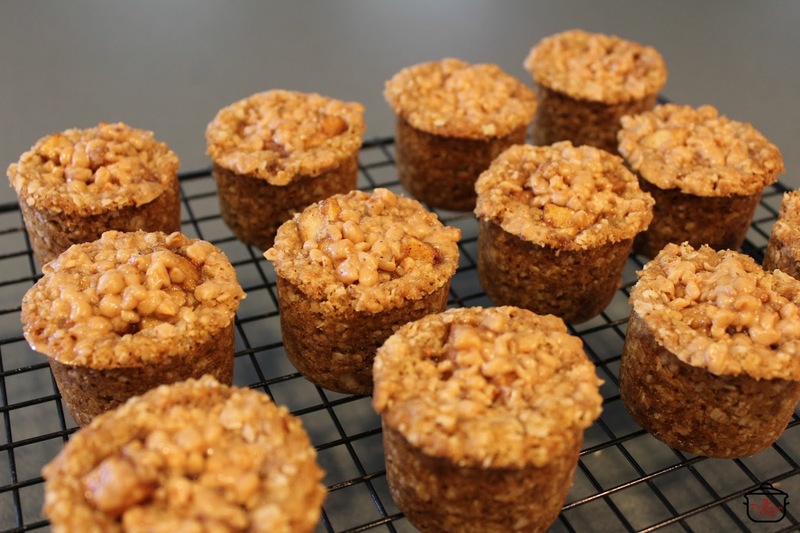 After each cup is filled, go around to each cup again and sprinkle just a little bit of the brickle bits on the top. Bake at 350 degrees for approximately 20 minutes. As a general rule, when I am making a new recipe, I usually set my timer for 5 minutes less than recommended. I check it, and usually pop it back in the oven. That insures that I never burn my food. After all, all ovens are different. 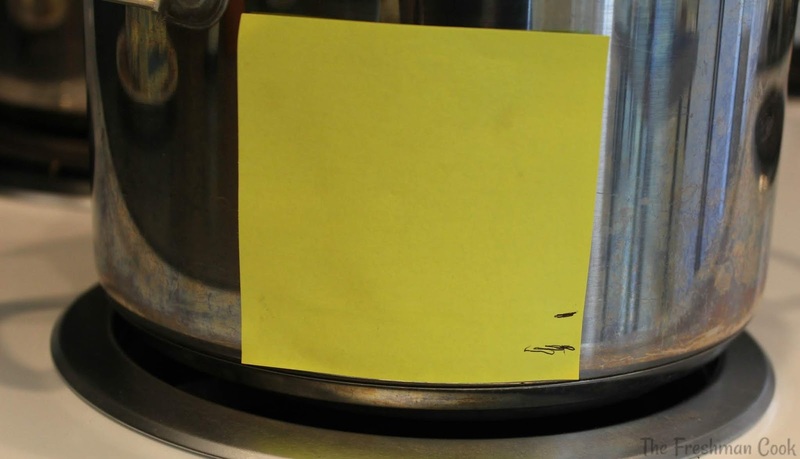 When your cups are done, remove them from the oven, let them cool for approx. 10 minutes. Then remove them from the pan, and let them cool completely on a cooling rack. I melted the caramel chips on the stove top, and then drizzled the caramel over each tart as I served them. They tasted great! Thanks so much for joining me today and for participating in the first day of #appleweek! 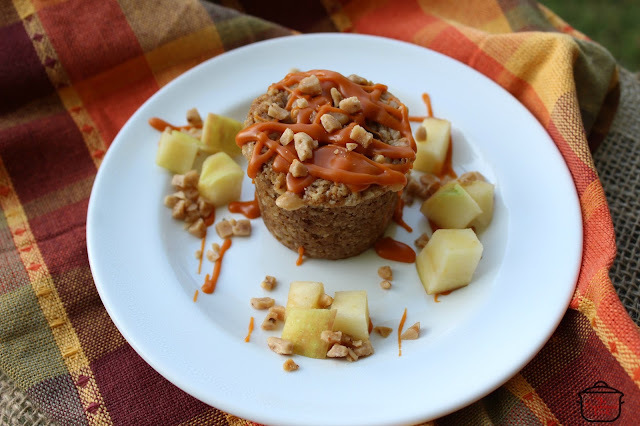 Scroll down to find lots more apple recipes, a printable copy of this recipe, and info on entering the giveaway! Click on "a rafflecopter giveaway" at the end of this incredible list of great prize packs to enter. Bake at 350 degrees for approximately 20 minutes. As a general rule, when I am making a new recipe, I usually set my timer for 5 minutes less than recommended. I check it, and usually pop it back in the oven. That insures that I never burn my food. After all, all ovens are different. 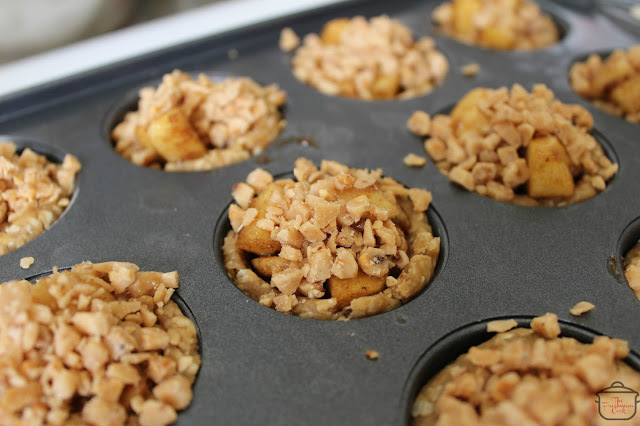 When your cups are done, remove them from the oven, let them cool for approx. 10 minutes. 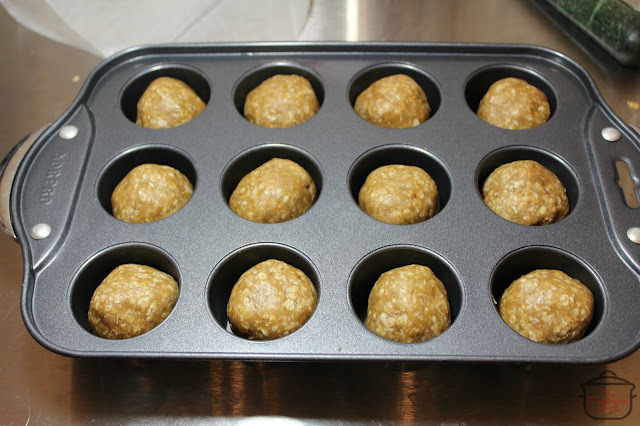 Then remove them from the pan, and let them cool completely on a cooling rack.